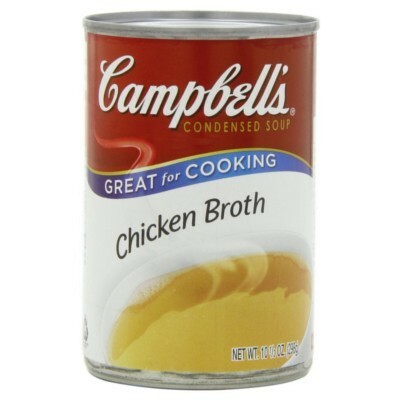 A can of chicken broth from Campbell's has been a staple in American kitchens for over a hundred years. Interestingly, the creator of condensed soups studied French cuisine when he developed this chicken broth and other Campbell's soups. Now you can stock your pantry once again with this versatile US soup. Use it to create deliciously good soups, stews, and casseroles. Stir together 1 can soup and 1 can water. Heat in microwave using microwave-safe container, or prepare in saucepan while stirring continuously. Chicken stock, water, chicken fat, less than 2% of: salt, yeast extract, flavor enhancer E621, dextrose, corn oil, flavoring, hydrolyzed soy protein. Contains GMO. Nutrition facts (for 100ml): calories 17Kcal, total fat 1.7g (saturated fat 0.4g), total carbohydrate 0.8g (sugar 0.8g), protein 0g, salt 1.6g.